We'll create you a first class quality swimming pool. Pools of Distinction will appraise the site and help with initial design of the pool. Incorporation of the owners needs, desires and dreams allows the owner to give the pool their own personal touch. grown through their experience, reliability and quality of work. Now many of the swimming pool quotes that are done come from recommendations from very happy pool owner's. "We just wanted to write to say thank you for our beautiful pool. We are absolutely thrilled! The end result is just what we had hoped for both to look at and swim in. More importantly we wanted to say thank you to all of the people you have working for you. Everyone is so friendly, efficient and patient with us. Our children enjoyed seeing the work being done, and we really appreciated the way everyone treated them and spoke around them. "Thank you so much for building a first class pool-we love it. I will certainly be recommending your company to people I know. "We would like to thank you, your staff and contractors for the professional way in which our old pool was replaced with a lovely new pool, we are delighted with the end result. 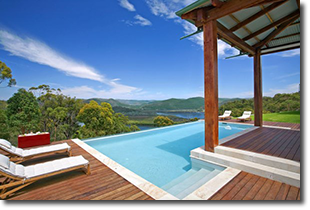 Pools of Distinction have been established in the Central Coast region since 1995, specialising in concrete pool and spa construction and renovations. Pools of Distinction have grown through their experience, reliability and quality of work. They excel in design and construction so much so that many of the pools they build have been referrals from very happy previous customers. The team at Pools of Distinction are creative and innovative. They will appraise the site and help you design a modern pool with ideas that the potential pool owner may not have thought of. They will help guide you through this and the building process. It is Pools of Distinctions aim to work together with you to create a first class Pool of Distinction.